This is of course by no means a complete list of comics set in a post apocalyptic world, just a few that share the same general theme, though they each have a very different take on it. Gus is a human/animal hybrid- part boy and part deer. His parents raised him in isolation to protect him, but now everything is falling apart and he is alone. Alone, that is until he meets Jeppard, a crusty old man who promises to help him reach the "Preserve", a place where people like Gus can be safe. 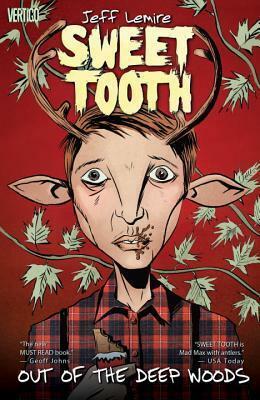 Created by Jeff Lemire of Essex County and The Underwater Welder, Sweet Tooth is an interesting story, with nary a zombie in sight. I spent all of volume one anxious about the innocent young Gus, because you just know the outside world is going to be a huge shock to him. It's a bit of an emotional journey, but well worth it. In a post-apocalyptic Australian landscape, the outlaw, Tank Girl (aka Rebecca Buck) lives in and drives a tank. She shares her adventures with her boyfriend, Booga, who is a mutant kangaroo, several talking stuffed animals, and a small cast of other human characters. 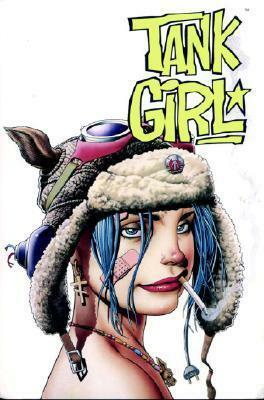 Tank Girl has been through quite a few incarnations, with a few changes to the team of artists and writers, but the core of the comic has remained essentially the same. The plot is secondary to the general vibe of anarchy and absurdity. It's a lot of fun. Eiapocalypseafter the apolcalypse, humankind is working to rebuild civilisation. None are working harder than Genevieve Builder, blacksmith and scientist, who has built her own printing press to share her discoveries with other survivors. When a secret admirer hires a freelance courier to bring presents to Genevieve, the courier starts spending more and more time and her workshop and falls in love. 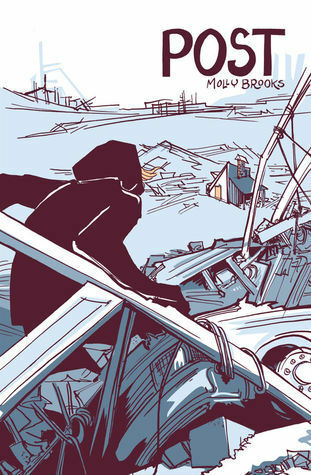 Post is a one-shot, self contained story, by artist and writer, Molly Brooks. It's a sweet, lesbian love story, full of hope and faith in humanity. The art works really well with the story, and, just as an aside, if I were making a film version I'd cast Gina Torres as Genevieve. Overnight a mysterious plague kills all the male animals in the world, except for one man, Yorrick, and his pet monkey, Ampersand. The surviving women attempt to rebuild their disrupted society. Yorrick travels in disguise, looking for his sister, Hero, and hiding from different factions who either want him dead or for some other agenda. 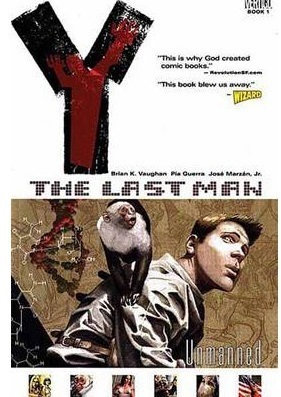 The Y the Last Man was published between 2002-2008 and has since been collected in 10 volumes. It is the creation of Brian K. Vaughn, of Saga and Paper Girls, and Pia Guerra. There are twists and turns and a fair bit of violence wrapped up in a great story. Humanity has been attacked by giant, man-eating, humanoid creatures called Titans. The survivors live in walled cities, and exist in relative peace for a century until one day one of the Titans manages to breach the walls. This Manga series has been hugely popular, and has given rise to an anime series, several novels, games and a live action movie and mini-series. 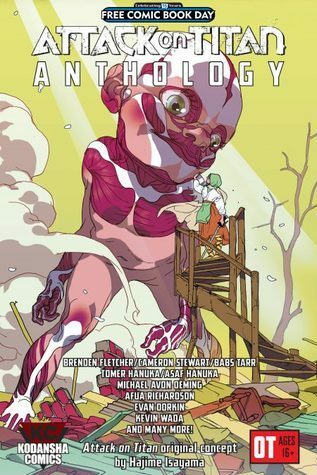 It had passed me by entirely until Comixology offered the Attack on Titan Anthology for Free Comic Book Day. This volume is a collection of short stories by different artist and writers, some of which I liked more than others. They're little snippets to get the reader interested in reading the series. The Titans in the first story are creepy, as they come in a variety of humanoid shapes, all of them grotesque, including some with extra mouths. However, I think peak creepiness was hit in the Tomer/Asaf Hanuka story, which has a beautifully renderered, horrifying baby Titan.